Review: Stef Mendesidis is a Greek DJ and producer now based in Russia. After releases on underground imprints such as Semantica, Projekts and Ben Sim's Symbolism, he proves he really is on the ascent with this killer EP for Ben Klock's esteemed imprint. 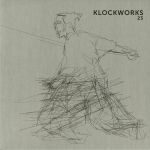 The three cuts on Klockworks 23 merge the best of direct and impactful big room techno with the atmospheric textures of deeper/hypnotic strains as best heard on the ethereal opener "Valley Of Machines" and "Senzo" in particular, which evokes those adrenalised moments with your eyes closed under the strobe light. The real killer on here is "Gendarme Classe A", a mentalist thriller that nails that Berghain 9 AM vibe so perfectly with its devilish Mike Parker style loops and claps on the kick for added impact.